The whole premise of The Last of the Firedrakes intrigued me. Who doesn’t want to find out that they’re a princess and go on a magical adventure in a new and strange land? I know that I would! And while there were many things I like about this one. One thing I need to mention is language. I normally read “clean” books. This one, while being written for young adults, is one I considered not finishing due to language. I don’t want to be a prude, and I pretty much overlook farmer words. There were a few of those in this one. One thing I don’t like is when a woman is referred to as the b-word. And that’s what happened in this book. And I really felt that where that was located in the story, it didn’t fit any way. In a different land that seems old and proper, you’re not going to hear anyone called our swear words. They may have their own however. Anyway…I liked Aurora as a character. She’s a 16 year-old. She’s lost two sets of parents. Her “aunt and uncle” aren’t overly kind to her. And one evening, she finds herself sold by her uncle to a scary monster from another world. This is where things get interesting! She’s taken to another world, a world of magic and mythical creatures. A world where she stands out like a sore thumb. But a world where she actually does belong. I loved that she discovers that she’s truly a princess, every little girl’s dream. And that she most likely possesses magic that she’s going to need to control. Her time at school reminded me a little bit of Harry Potter. School was where she was going to learn to control her magic. All while being disguised so no one knows she’s a princess. Aurora or Rory as she’s known at school is constantly getting herself into trouble though. She doesn’t know enough about who to avoid and she’s a bit naive about what people’s motives are. I liked that she has a dear friend, Vivienne. There’s also Rafe, the Black Wolf, who has saved Aurora more times than she can count. And Kalen the fay. This one has an interesting plot and cast of characters. If you can overlook a few words, it’s really a great story! 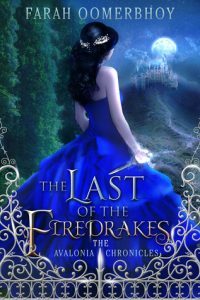 I was sent an e-copy of The Last of the Firedrakes as a gift from the publisher. All opinions are my own.